Location: A couple of minutes drive north of Te Awamutu. 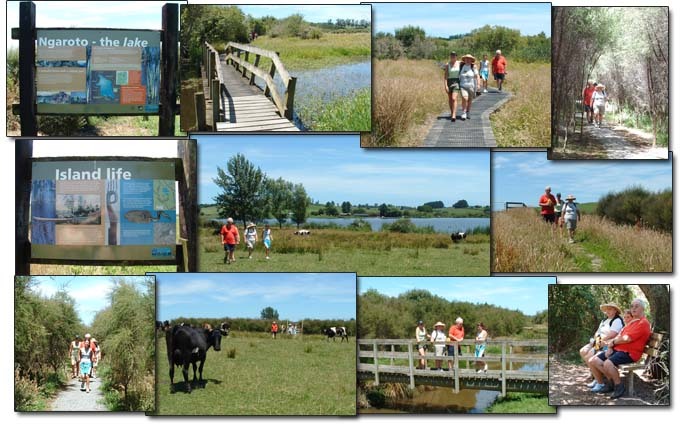 Lake Ngaroto, home to a range of water-loving plants and animals, is one of the best places in the Waikato to experience natural wetland. A 90-minute walk around the lake includes regular signs with information and illustrations about the local ecology. The walk is flat, well-maintained and relatively easy for able-bodied people. The walk is open all year although parts may be wet in winter. Some parts of the track have no shade and get very hot in Summer. A sun-hat is recommended. See below for directions and more notes. Head north from Te Awamutu towards Hamilton (on Ohaupo Road). About 2km past Taylors Hill (the big hill leading out of town), turn left into Ngaroto Road. Note that this turnoff is immediately after a corner so be careful not to miss it. Follow the road all the way until you come to a T-intersection with Paterangi Road. Turn right. Take the next road on the right (Bank Road). Follow this road until you come to the lake. When you arrive at the carpark area (pictured here), the entrance to the walk is on the right. This is more of a bush walk than a lakeside walk - for most of the track the lake is not actually visible. At a couple of points in the walk you find yourself in paddocks (fields) and it isn't obvious where to go. Keep walking more or less straight ahead and look for a stile at the other end. Mountain bikes are not permitted on the track. Duck shooting season operates in May and June. Hunters may use the track to access maimais.